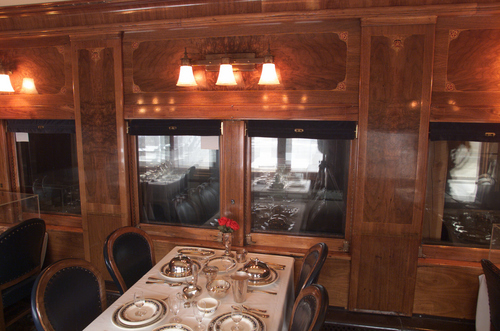 This view is in the Palace Sleeping Car "Omemee:, and part of the set of the 1907 "Soo-Spokane Train Deluxe". This international train was operated by the Canadian Pacific Railway between Minneapolis, MINN and Spokane, WA., but through Canada, the Crowsnest Pass route and Cranbrook. It is designated Canadian Cultural Property due to its importance to Canadian heritage. The stained glass half-dome, one of two in the main room of the car, contains 1250 pieces of glass. 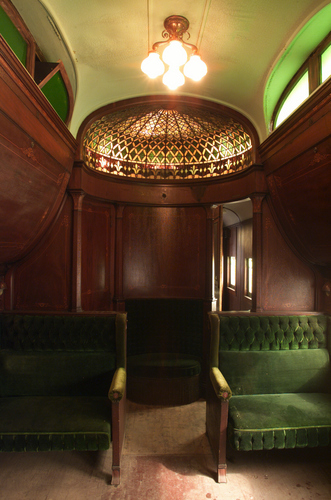 The interior paneling is walmut and mahogany with Art Nouveau style inlays, mohair plush upholstery and other refinements. 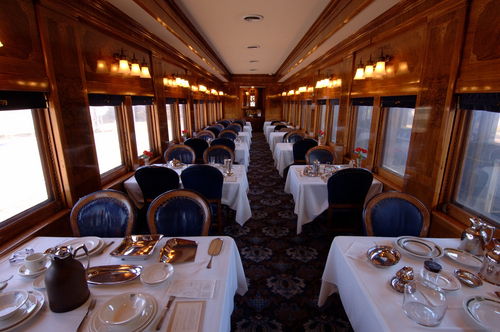 This is a view of the restored dining car Argyle from one end of the dining room showing the 6 tables for two and 6 tables for 4 for a total seating of 36. The wool Axminster carpet, blue-calfskin upholstered chairs and inalid Black Walnut paneling were restored in 1978-86, and still looks the same today welcoming thousands of visitors every year. The tours of this and 16 other cars and heritage rooms show great detail about passenger car design and architecture. It is an interpretation unique to this Museum on this scale. The neo-classical brick facade of the Entrance Hall is designed as an appropriate "approach" to the luxurious trains that make up the primary displays at the Museum. The large interior of the Entrance Hall also houses the 2-storey-high carved oak fireplace from the formal dining rooms of the former CPR Royal Alexandra Hotel (CPR) in Winipeg. It is a major first impression for visitors that signifies that the museum is design and lifestyle history oriented, instead of mechanical or technological approach found at most railway museums. The Royal Alexandra Hall is the centrepiece of the buildings at the Museum and is the former Grand Cafe of the CPR's 1906 Royal Alexandra Hotel in Winnipeg, demolished in 1971 but restored here from 1999-2004. 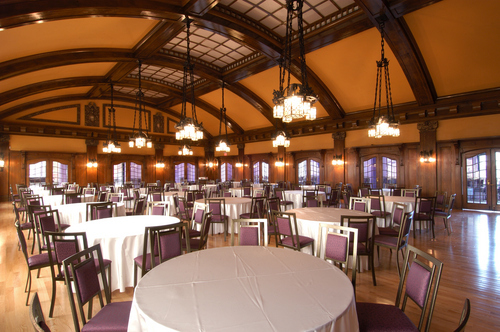 The room is 3000 square feet of Oak, with high valuted ceiling rising to 24 feet with chandeliers that hang 12 feet down from the arches. It seats 184 for dinner and 280 for performances, with excellent acoustics. 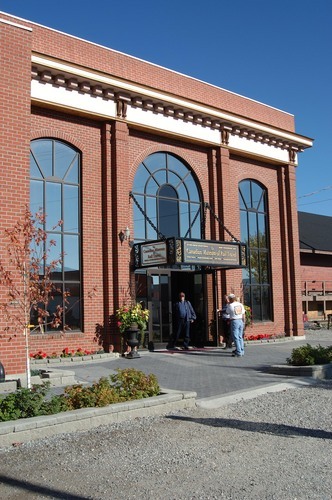 It received Heritage Canada's 2007 restoration award, and is also on tour along with the historic trains.